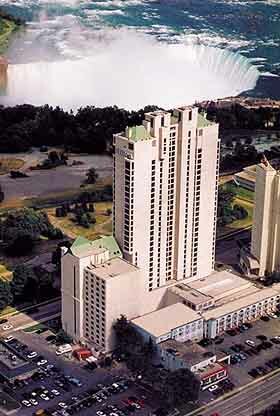 Directly overlooking the widely recognized Canadian "horseshoe shaped" Niagara Falls and the adjacent American Falls is the Hilton Niagara Falls Hotel. The hotel was designed to provide a panoramic sweeping view of the falls from every room, including the conference and meeting rooms. Whether you are traveling to Niagara Falls on business and/or pleasure - the Hilton at the Falls in Ontario is the perfect destination. The Hilton is centrally located to most all the attractions such as the Horseshoe Falls, Casino Niagara, Floral Clock and Gardens, Niagara on the Lake, Whirlpool Golf Course, Maid of the Mist Boat Tours, Scenic Tunnels, School of Horticulture, Minolta Tower, IMAX Theater, Skylon Tower, Great Gorge Adventure, Shaw Festival, Niagara Helicopters and Marineland. The guest rooms are designed in a classic style with wrought iron and wood furnishings, choice of suites are available and two queen sized beds are in each. There are large windows to view the falls, 25" cable TV, AM/FM alarm clock, coffee maker in room, iron and ironing board, in-room movies, complimentary newspaper, safe deposit box, telephone modem lines and rollaway beds are available. Available services at the hotel include bar and lounge, laundry/valet services, business center, concierge, on-site restaurant, room service, fitness center or spa and shops and commercial services. The Watermark Restaurant is one-of-a-kind rooftop restaurant with aquariums, 18 foot windows, vaulted ceilings and serves continental cuisine for breakfast buffet, lunch and dinner. There is private dining areas provided for and multi-level seating and a cocktail lounge. The Hilton sports a 10,000 square foot indoor pool with 27-foot waterslides, large whirlpools, and a poolside cafe. This is by far one of the most romantic get-aways at Niagara Falls. 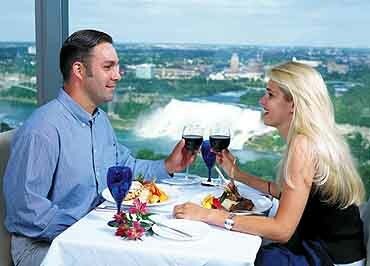 The Hilton Niagara Falls is a very popular choice for banquets, business meetings and conferences and weddings. Conference and banquet meeting rooms and halls are readily available with full service catering, visual audio and a business center with fax, copy, secretarial and internet modem hook-ups. Bring on the wedding party and relax while the Hilton Niagara Falls makes the arrangements. The professional staff of the Hilton Niagara Falls is fully prepared to assist you to insure your visit is a successful one.